Tuck (2001) responds to the century old taxidermy collection of the Banff Park Museum National Historic Site, in Banff, AB. In a filmed performance I wander through the silent museum at dusk. I tiptoe between the glass cases singing lullabies to each animal, the lyrics created especially for them. In my songs I ask the mountain sheep to lie down and the wolverine to close his eyes. Sadly, the animals do not budge from their poses and they remain alert. I turn off the lights in their dioramas and continue my efforts. 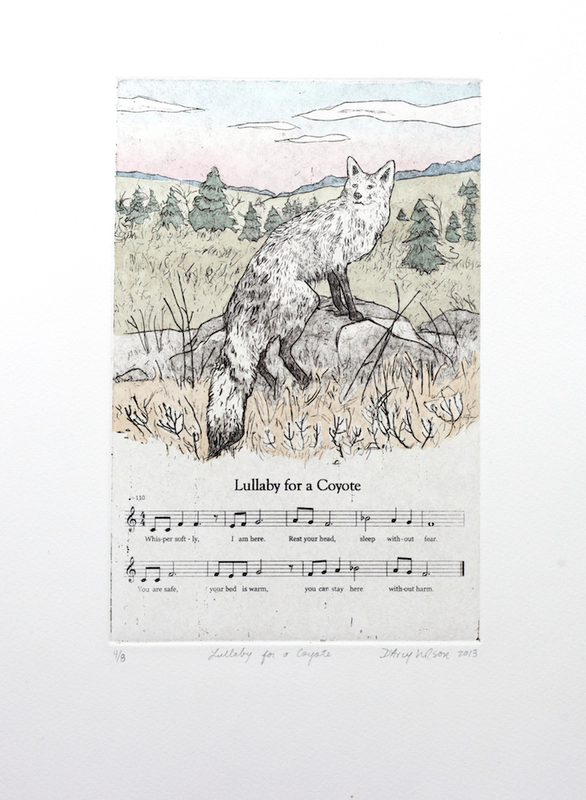 This activity of singing lullabies presents an alternative to the liaison formed between the specimens and their creators (the hunters and taxidermists who prepared them a century ago). Nevertheless, there is perversity in both our actions: the animals were killed for display, and now I propose to sing them to sleep, overlooking their inability to abandon their posts. 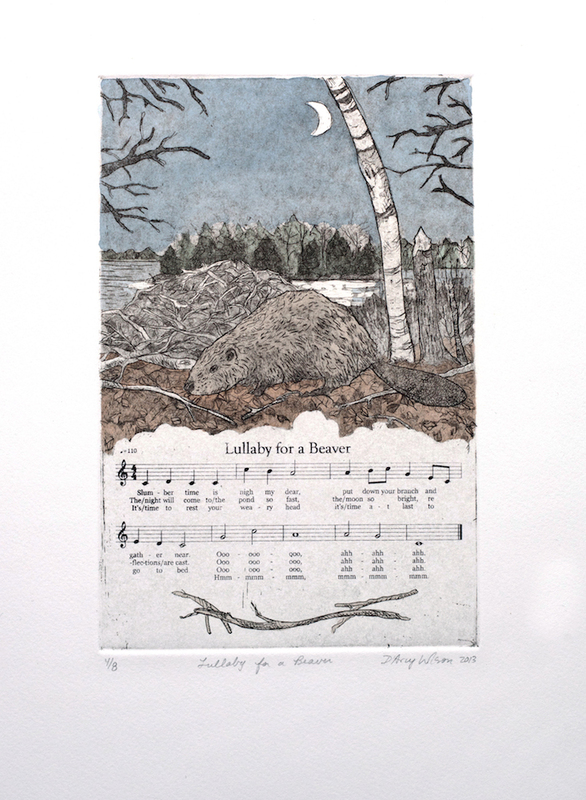 (This project received support from the New Brunswick Arts Board, artsnb). 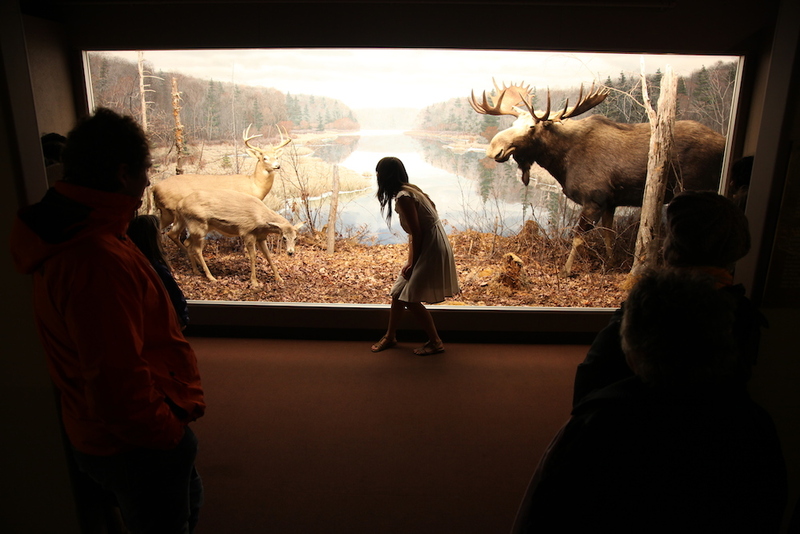 Tuck has been repeated for a live audience at the Nova Scotia Museum of Natural History during Nocturne (Halifax, October 2012). 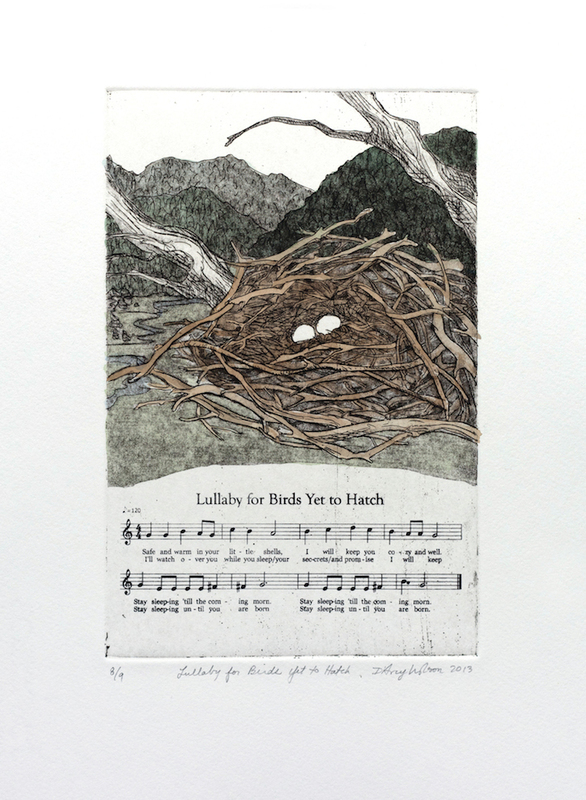 Each print is editioned in a series of 8 except: “Lullaby for Birds Yet to Hatch” (edition of 9), and “Woodland Lullaby” (Edition of 7). 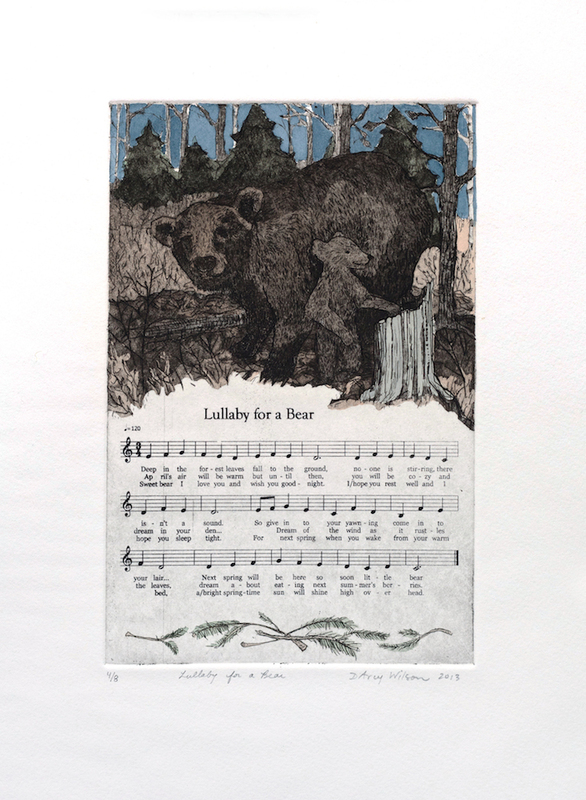 D’Arcy Wilson (MFA University of Calgary ’08, BFA Mount Allison University ’05) is a Halifax based interdisciplinary artist whose works considers the relationship between people and the wilderness, addressing themes of vulnerability, alienation, and isolation. Her projects have lead to collaborations with wildlife rehabilitation centers, natural history museums, national parks, and choirs. She has had recent solo exhibitions at La Centrale Galerie Powerhouse (Montreal, 2014), Forest City (London, ON, 2014), ArtsPlace (Annapolis Royal, NS, 2014) The Owens Art Gallery (Sackville, NB, 2012), The Khyber Centre for the Arts (Halifax, 2012), and she has had two-person shows at the ODD Gallery (Dawson City, 2012), and Arnica Gallery (Kamloops, BC, 2014). Her performances have been presented in MS:T (Calgary), at the Museum of Natural History (Halifax), Struts Gallery (Sackville, NB), Third Space (Saint John, NB), and others. 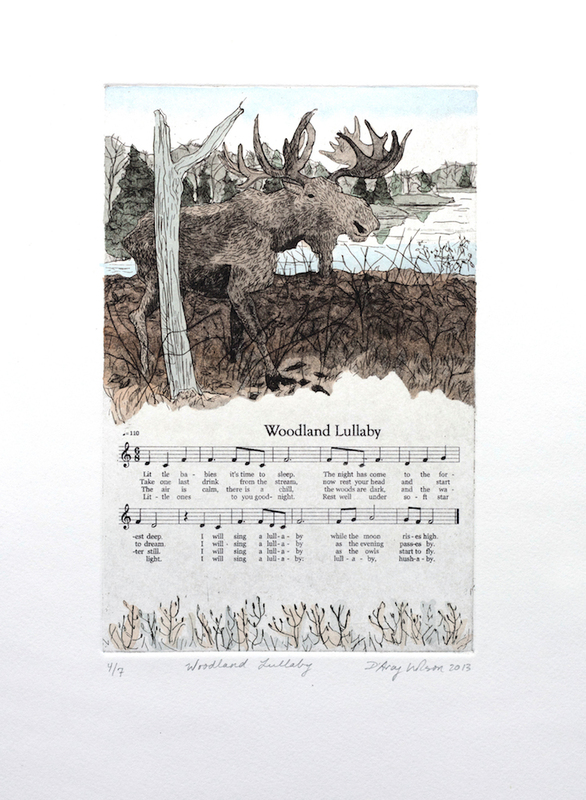 D’Arcy has participated in group shows throughout Canada and in artist residencies at the Banff Centre, Atelier D’Estampe Imago (Moncton, NB), and within Halifax Regional Municipality. IOTA/MB: You speak about “bestowing acts of kindness on nature” in your artist statement, what constitutes an act of kindness for you? DW: Within the context of my artist statement, it is any caring act that does not exploit the natural world in any way. Such acts may be loving, admiring, inquisitive, or helpful, and they embody good intentions. It should be noted, however, that while I try to be kind to nature, themes of failure and futility are prevalent in my work. IOTA/MB: In your performances you sometimes take on animalistic characteristics, such as in Mother (2014), where you lick clean, Canadian wildlife toy animals that have been soaking in maple syrup in China teacups; can you write about your connectivity, or lack thereof (if that is the case), with the natural world, and how you interpret this within your performance work? DW: In each of my performances, my interactions with wildlife (or simulated wildlife) is on my own human terms: in Tuck, I sang lullabies the way I was sung to as a child; in Fleshold, I hand sewed quilts recalling those that I had been given by loved ones; in Protect Your Love, I tried to communicate with wild animals in my own language. Mother differs in that I am trying to be animal-like in my caring act; nevertheless, this gesture recalls early childhood play and make-believe. Throughout these works, my inability to connect with nature is obvious in my awkward thoughtfulness and in the absence of other living animals. IOTA/MB: In your photographic works Night Watch, you walked into the Banff National Park each evening at dusk, walked until you felt afraid and then took a photograph. It’s easy to know what you may have been afraid of, but can you elaborate on “why” you think we are afraid of a relationship between animals and humans, despite our politically powerful position? DW: I don’t think we are afraid of a relationship between animals and humans— rather, I think we are delusional in seeking or hoping for such relationships. IOTA/MB: Is there a power play? Or are you giving back power to these animals, and these natural sites? DW: Rather than a power play, I see a powerlessness. While this is more recognizable when considering the animal, the human seems powerless to evade their destructive nature, even if they wish to. It seems as though any time humans and wildlife come in close proximity, even in instances of sincere respect there is great potential for harm to occur, usually to the animal. Night Watch does turn the table as I reckon with my own vulnerability; I had to stop the project because there was a cougar sighting in the area. IOTA/MB: We see Land Art as large-scale re-interpretations of site, manipulation of natural objects and questions on site-specificity of natural resources and materials. (And perhaps at times an exercise of control over the natural environment.) Your interaction with landscapes is different in the way you interact with nature as a naturalist would (albeit less scientifically): observing the landscape while acknowledging your disruption, no matter how minimal on the state of nature. Is there a relationship between land art and your performance work? DW: Sure, I particularly admire the work of Richard Long, his quiet alterations to the landscape from his own human touch and his gentle deposits of bodily trace in nature. Nevertheless, my work is of a different camp— I don’t need to touch or mark any part of the scene; to scuff my feet in the dirt, or manipulate delicate branches, or pour asphalt over a hill side (which are all loaded acts in their own way)— I only need to enter a wilderness space to disrupt its dynamic. In no way do I ever seek to alter my terrain, rather I grieve my inability to leave it intact. While some land artists sought control over their natural environment through its alteration, I reject the control I have over my surroundings, but I am unable to relinquish it without removing myself. IOTA/MB: Are your projects also missives? DW: They are more of a lament, or a reckoning. Sometimes this is subtle and self-deprecating (As in Protect Your Love), and other times it is a public mourning (as in Recalling Your Presence While Calling Your Name: In Memoria, a public memorial service held in Point Pleasant park for the wildlife that has been extirpated from the city of Halifax.). They are not so optimistic as to offer a warning or a message; instead they are unconventional moments of healing and acknowledgement of grief and guilt. But mourning can be regenerative, so there is a flicker of optimism. 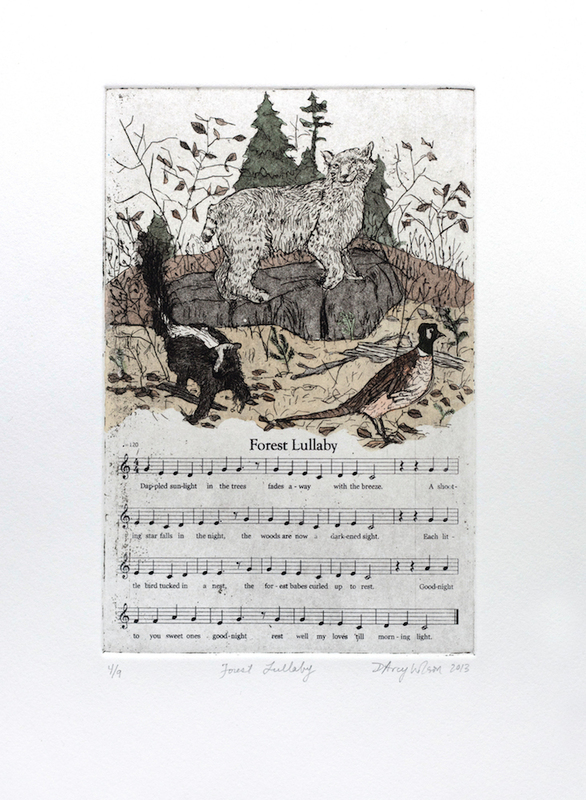 DW: The Memorialist is a project beginning this summer that unearths the history of Halifax’s Zoological Gardens. Halifax was home to the first zoo in North America since colonial times, and while The Memorialist will publicly uncover the story of the zoo, it will also ponder why Halifax was the first settlement in the “New World” to transform the wild animal into spectacle. How have these early zoological gardens impacted our relationship to wildlife? A project blog will be launched shortly at www.thememorialist.com, which will track research and travel. Next fall will see several public lectures and performances, hosted by Centre for Art Tapes (Halifax), Gallery Connexion (Fredericton) and myself. You can visit me at Centre for Art Tapes to talk more throughout the spring and summer, as I am the Local Artist In Residence there now. Thanks to CFAT, and thanks to Arts Nova Scotia and the Canada Council for supporting the project.